Trade Union leaders in Burma have been jailed for asking for a $1 pay rise. 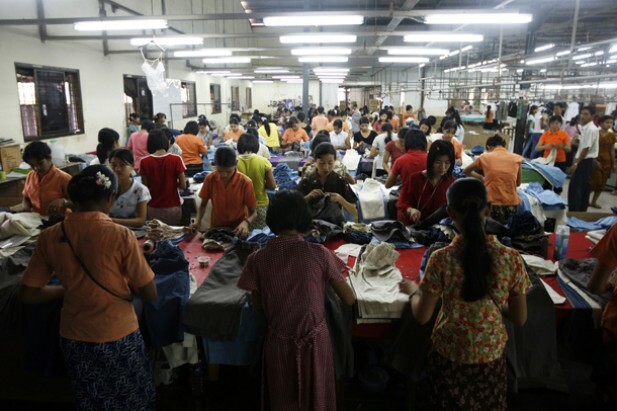 Garment workers in Rangoon are protesting over pay and working conditions in their factories. An average worker gets paid only 43 US cents an hour. To make ends meet, they have to do two days overtime, meaning they often work 7 days a week. Workers have demanded an increase of $1 a day so that they can support their families better. Naing Htay Lwin and Myo Min Min are two union leaders who were arrested for organising protests calling for a pay rise of $1 a day. They were arrested under a repressive law which bans protest without government permission, and they were also falsely accused of advocating violence during protests. They were charged under two different counts, and they are being detained in the notorious Insein Prison in Rangoon. If they are convicted, they could face up to 3 years in prison for organising peaceful protests. Activists in Burma need your help. Please take action by writing to U Win Mra, the chairman of the Myanmar National Human Rights Council, to call for the immediate release of Naing Htay Lwin, Myo Min Min and all remaining political prisoners in Burma. With RG posted about ‪#‎KisaanMitraRG‬. Rahul Gandhi takes water from a farmer family during his 15 Km Padyatra supporting cause of farmers. Rahul Gandhi meets with the distressed family of a farmer who committed suicide in Maharashtra. With RG added 2 new photos. Rahul Gandhi added 3 new photos. Visited the Sirhind, Gobindgarh and Khanna Mandis of Punjab. Interacted with farmers and assured them that he would keep coming to Punjab as long as their problems remain unsolved. Kids of RBK International academy will celebrate ‘International Labour Day’ at Eiffel Tower with labours. Kids and labours will cut the large cake weighing 10 kg. This celebration has been organized to respect the incredible work the labours do. Kids will cheer up labours by distributing sweet boxes to them. सूचना आयोगों को प्रेषित किए जाएँगे. उमानाथ बाली प्रेक्षागृह के जयशंकर प्रसाद सभागार में. अधिक लोकप्रिय है . आरटीआई एक्टिविस्ट भी मानवाधिकार कार्यकर्ता ही हैं. दिए जाने की माँग भी उठाई गयी. मामलों में तो आरटीआई के मुक़ाबले अन्य माध्यमों से सूचना पाना आसान है. कार्यक्रम की अध्यक्षता सेवानिवृत्त न्यायाधीश कमलेश्वर नाथ ने की. देश भर से आए आरटीआई कार्यकर्ताओं का मार्गदर्शन किया. कार्यक्रम में मुख्य वक्ता थे. 2015’ देकर सम्मानित किया गया. प्रसाद ने तृतीय पुरस्कार जीता. मुकाबला किया और पारदर्शिता की मशाल की ज्वाला को मध्यम नही पड़ने दिया. के लिए आरटीआई बहादुरी सम्मान 2015’ प्रदान कर सम्मानित किया गया. उपलब्ध कराई गई आरटीआई मार्गदर्शिका का नि:शुल्क वितरण भी किया गया. New Delhi, April 29, 2015: JCB today moved to support the relief effort in earthquake-hit Nepal with the donation of diggers and electrical power generators worth around $1 million. Ten backhoe loaders were made available immediately to the Nepalese Army and are now at work in the areas worst hit by the disaster which has left more than 5,000 people dead and 10,000 injured. JCB supplied the backhoes through its dealer, MAW Enterprises Pvt Ltd, in Nepal. The electrical power generators are also en route from JCB India’s factory in Delhi to help stricken communities caught up in the quake. The JCB backhoe loaders have been deployed to help ground relief efforts in the aftermath of the earthquake which measured 7.8 on the Richter Scale. In the coming weeks and months, the donated machines will be used in reconstruction efforts. JCB has a long history of helping countries affected by major natural disasters, providing $500,000 worth of machines and generators to the Philippines when Typhoon Haiyan struck in 2013. Machines were also donated when earthquakes struck in Haiti in 2010 and in China in 2008 and to southern India, Sri Lanka and Indonesia in 2004 following the Boxing Day Tsunami. JCB India Limited, Ballabgarh (Haryana) is a fully owned subsidiary of JC Bamford Excavators Limited, UK, one of the world’s leading manufacturers of earthmoving and construction equipment. Worldwide, JCB produces over 300 different models, which are sold in over 150 countries. In India, the company offers twenty six different machines in seven product types such as Backhoe Loaders, Wheeled Loading Shovels, Tracked Excavators, Vibratory Compactors, Telehandlers, Skid Steer Loaders and Gensets. It offers an excellent network of 60 dealers and over 600 outlets throughout India along with a world-class customer service network support JCB. PS: Caption: A JCB backhoe loader pictured in Katmandu, Nepal, yesterday (April 28th) digging through the debris of a collapsed ancient temple after the earthquake. JCB has donated 10 backhoes to the relief effort. Around the globe, journalists are attacked every day as they try to carry out their work. In the last year alone, 61 journalists were killed. Many more languish in jails without charges or any sign of due process, the victims of Governments and others that prohibit free inquiry and use the power of the State to intimidate the press. As we mark World Press Freedom Day this year, let us honour the memory of those who lost their lives and intensify our efforts to uphold the fundamental human right to freedom of expression and press freedom. This year’s theme, Let Journalism Thrive! Towards Better Reporting, Gender Equality, & Media Safety in the Digital Age emphasizes the importance of ensuring a free and pluralistic media against the backdrop of a fast-paced and ever-changing digital world. Digital technology has been exploited to spread hate speech or incite violence, but it is also a force for good, bringing people together in a global conversation about how to build a better world. In particular, digital technology can have a positive impact as leaders strive this year to formulate an ambitious agenda to advance sustainable development for years to come. However, digital journalists and bloggers are also facing retribution and curbs on their freedom to report. Thriving journalism — whether in digital or more traditional form — must be anchored in quality reporting and information dissemination to all segments of society. Women play a critical, yet far too neglected, role in in today’s media landscape. On this Day, I call on all Governments, societies and individuals to uphold the principles put forward by Member States on the need for the free exchange of information and ideas, both within and among nations. We must commit to ensure that the safety and human rights of journalists are protected, independent of the political, socioeconomic or cultural pressures that may threaten, impede or deter their freedom to keep the world informed. Journalism and the press can help advance our efforts to achieve the objectives of the proposed sustainable development goals. If we are to move forward with a new development agenda, we need to understand that information must not only be universal, but also free to challenge the status quo, and to provide a window of hope to those whose voices are silenced by the censorship of corruption, violence, intimidation and retaliation. The Union Cabinet has approved Smart Cities Mission in 100 Cities and also cleared the old housing projects initiated by the previous government. The decision in this regard was taken at the Cabinet meeting chaired by Prime Minister Narendra Modi in New Delhi this morning. The Smart City project was announced in July 2014 in the current government’s first Union Budget last year. The Cabinet also gave its seal of approval to continuation of the minimum pension of 1000 rupees per month in perpetuity to pensioners under Employees’ Pension Scheme, EPS, 1995 beyond the financial year 2014-15. Currently, it is effective only upto March this year. It approved corresponding grant of continuous annual budgetary support for implementing the minimum pension which will be to the tune of 850 crore rupees per year on a tapering basis. Providing a minimum pension of one thousand rupees is an effort to provide meaningful subsistence to pensioners who have served in the organized sector. The present proposal is likely to benefit approximately 20 lakh pensioners under EPS, 1995. The Union Cabinet gave its nod to amendments to the Prevention of Corruption Act. The proposed amendments will fill in perceived gaps in the domestic anti-corruption law. It also help in meeting the country’s obligations under the United Nations Convention Against Corruption more effectively. The proposed amendments are mainly aimed at laying down more stringent measures to tackle corruption. The bill provides for more stringent punishment for the offences of bribery, both for the bribe giver and the bribe taker. It is also proposed to extend the protection of prior sanction for prosecution to public servants who cease to hold office due to retirement and resignation. AIR correspondent reports the Prevention of Corruption (Amendment) Bill was introduced in the Rajya Sabha in August 2013. The Department Related Parliamentary Standing Committee submitted its report on the Bill to the Rajya Sabha February last year but the Bill could not be passed. The Cabinet also gave its approval for amending the Companies (Amendment) Bill, 2014. The Amendments will do away with the requirement of filing a declaration by a Company before commencement of business or exercising its borrowing powers. The amendments also seek to rationalise the procedure for laying draft notifications for exemptions to various classes of companies or modifying provisions of the Act to ensure speedier issue of final notifications. These amendments will address issues related to ease of doing business and put in place a speedy process for approval of draft notifications. The Cabinet also approved introduction of the Compensatory Afforestation Fund Bill, 2015 during the current Session of Parliament. The proposed legislation is aimed at providing an appropriate institutional mechanism, both at the Centre and in each State and Union Territory, for expeditious utilization of amounts realised in lieu of forest land diverted for non-forest purpose. The Union Cabinet also gave its approval for the conversion of two additional battalions of the Sashastra Seema Bal for the National Disaster Response Force and for strengthening existing NDRF battalions. The objective of the conversion of these two additional battalions of SSB into NDRF battalions is to provide response to the area of Eastern Uttar Pradesh, Madhya Pradesh and Arunachal Pradesh during any natural and manmade disaster and to enhance the capability of the existing NDRF battalions. The placement of two NDRF Battalions at Varanasi and Arunachal Pradesh will fill up the vast gap of deployment of the NDRF. The Cabinet also cleared introduction of the Merchant Shipping (Amendment) Bill, 2015. It also approved accession to the International Convention for the Control and Management of Ships’ Ballast Water and Sediments, 2004 of International Maritime Organization. Ships fill their ballast tanks with water to stabilize vessels at sea for maintaining safe operating conditions throughout a voyage. Ballast water reduces stress on the hull, provides transverse stability, improves propulsion and maneuverability and compensates for weight. However, ballast water poses serious ecological, economic and health problems due to the multitude of marine species being carried in the process, including Harmful Aquatic Organisms and Pathogens.